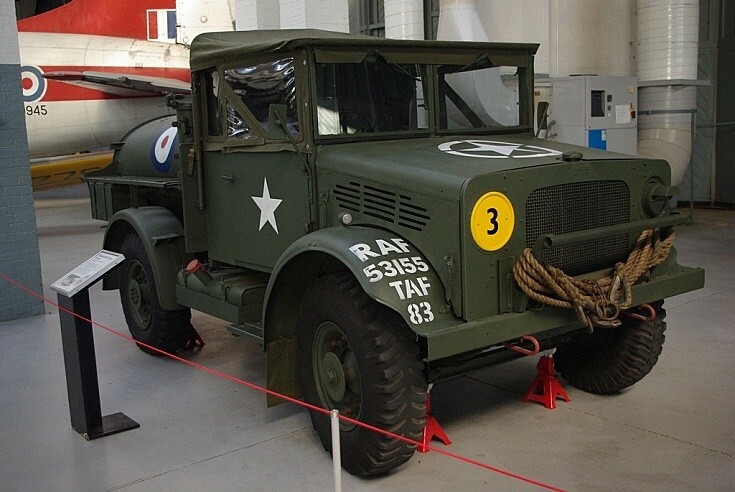 1937 British Bedford MWC Water Bowser at Duxford IWM. Both British and US marks? Added by Marcel Gommers on 04 October 2010. The Star was used by British and allied forces as an identifying feature. Previously red and white bars were used. Added by Roger Greenaway on 04 October 2010. During WW2 the white star was used as a generic recognition device by the allied forces. This made a vehicle instantly recognisable even in the frantic haze of action. Added by Chris Teesside UK. on 04 October 2010. A beautiful picture of a beautiful truck !But I don't understand that the year 1937 is mentioned :in that year the first prototype was produced, but it is not the production-date of the 53155. Full-width windscreen, the pressed out cooling slots in the bonnet, enclosed cab, metal half-doors, canvas top, perspex side-windscreens and loading sling flanges on the wheel hubs are all from the late type!Only the internally fixed mesh grille is an early one.Can somebody explain me why the mentioned year isn't 1942 or later ? On a picture from the nearside door I see a white star, the number 53155 and "TYPE 2500".What is the meaning of "TYPE 2500"? On the offside front wing I read:TAF83 RAF53155.On 2 dec 1944 the TAF83 organized in the Sergeant's Mess in Eindhoven (B.78), Netherlands, a Santa Claus-Black Pete Party for the poor war-children in Eindhoven! Added by Anton Haspels on 07 April 2012. Added by Roger Greenaway on 12 April 2012.